The Canary Islands are often described as having “the perfect climate” and this is probably true! Fuerteventura enjoys all year round sunshine with the highest recorded temperature being 43 degrees. August is the hottest month with an average temperature of 25 degrees and the coldest month is January, with an average temperature of 18 degrees. Fuerteventura translates to strong wind, so you should expect just that during the trade wind season! The island is the host to the World Windsurfing Championship which take place in the South of the island in Jandia. It rarely rains on the islands and that also goes for Fuerteventura! With an annual rainfall that amounts to less than 200mm, most of which occurs form October to March. December is the wettest month with an average of 23mm of monthly rainfall. As Fuerteventura is so close to the coast of Africa the average sea temperature is a comfortable 22 degrees. 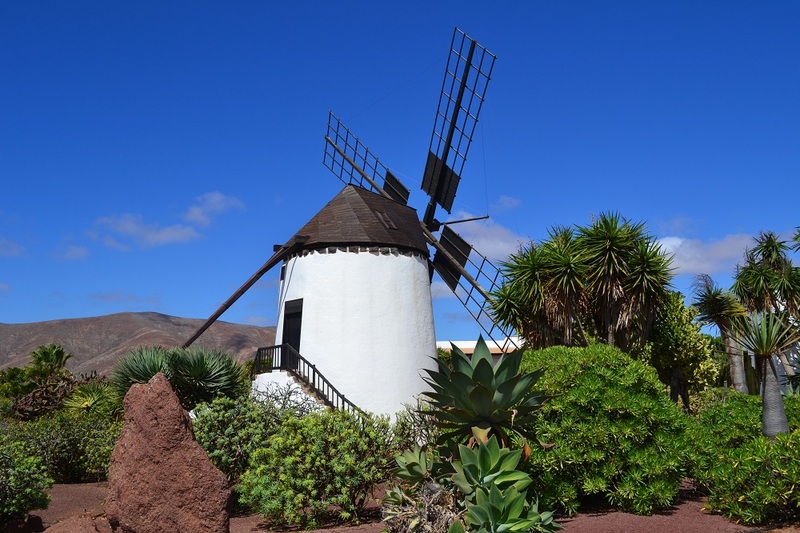 The best time to visit Fuerteventura is in late Spring or early Summer when peak temperatures are in the mid-20s, when rainfall is minimal, humidity is low and the sun is booming. Fuerteventura has 4 main resorts. Corralejo is a town located on the Northern tip of Fuerteventura and it faces the smaller island of Lobos. The area has 11km of fine sand and several kms of sand dunes. The waters around Corralejo are clear and a beautiful shade of blue, but they can be affected by strong currents. If you are after nightlife Corralejo is by far the best resort for evening entertainment and it caters for most ages. Corralejo is also home to the islands only water park. Morro Jable is a town situated in the most Southern part of Fuerteventura and it attracts a predominantly German clientele. It is incredibly clean and has a modern feel. Originally a tiny fishing village it is now lined with palm trees, hotels and shops on one side and the beach on the other. The Playa de la Cebada beach in the old town is very sheltered, the sea is beautifully calm and it has shallow waters, which makes for a very safe and pleasant to place to swim. The resort of Caleta de Fuste is situated 8km away from the airport and it attracts mainly British tourists. The artificial beach is made from imported Saharan sands. This resort is purpose built with pubs and restaurants located throughout the commercial centre and along the main avenue, so you will find no old town here. There is a cinema showing English films and whilst there isn’t much of a nightlife compared to Corralejo, there is still plenty to do at night. Costa Calma is the resort to go to if you are looking for a relaxing and quiet holiday. The resort is situated 80km South of the airport and it offers the best beaches on the island along with a mix of nationalities. There is very little nightlife in this resort but the hotels do offer evening entertainment. Morro Jable Harbour is located on the South of the island and it is the closet marina to the neighbouring island Gran Canaria. There is a fuel dock situated at the marina, which enables the many vessels that make use of its 290 moorings to stock up. Each mooring is suitable for boats up to 35 metres. The Gran Tarajal harbour is again in the South of Fuerteventura, in Puerto de Gran Tarajal. This is home to both leisure yachts and fishing boats within its 170 moorings. In the North of the island you will find Corralejo Harbour, this marina is an ideal place to moor and explore the island. Whilst you’re there, why not discover the Isle of Lobos, which is less than a 15-minute sail away. There is capacity for 215 boats up to 15 metres in length. The small harbour of El Castillo is on the East coast of Fuerteventura and is less than 10 minutes from the airport in Caleta de Fuste. A selection of water-based activities are offered in the harbour, such as jet ski rentals, submarine excursions and scuba diving classes. Puerto del Rosario Harbour is located in Puerto del Rosario, in the East of the island. The harbour and port of Fuerteventura’s capital is mainly devoted to commercial shipping and ferries. Fuerteventura has a real mixture of accommodation. Raging from large 5* hotels to private villas, small boutique hotels and everything in-between.